If you want to start working out, push ups are one of the best exercises to incorporate into your new routine. As well as increasing strength in the arms, shoulders and chest, they will help to stabilize your core and tone the whole body. They are also an ideal exercise for beginners because there are multiple variations which can be adapted to suit the preferences and current fitness levels of the individual. However, it is extremely important to realize that performing a push up incorrectly can do more harm than good. The incorrect technique or even just pushing yourself too hard can lead to muscle injury, which can compromise your ability to keep working out and may even lead you to decide to quit your new fitness regime altogether. When you are a fitness novice it can be best to start with a very simple modified push up first, and gradually move onto other variations. The stronger you become, the more you can push your body for better results. If you have never really done push ups before, wall push ups are the ideal way to start. They are easy to do, even if you have very little strength and muscle tone in your upper arms and shoulders, but you will start to notice a difference in tone within six weeks. To do a wall push up, stand at arm’s length from the wall with your palms just touching it. Your feet should be slightly spread to give your body stability and your hands should be in line with your shoulders. Breathe in and gradually lower your body towards the wall, bending your arms at the elbow as you do so. As you exhale, push yourself back into your starting position. It is very important that your motion is smooth and controlled, and that you keep your spine straight. Do as many repetitions as you can to start with, but try to work up to three sets of twenty push ups. You should do your exercises three times a week for the best results, leaving at least one day in between working out. This allows your muscles time to recover. Once you feel that you are ready to move on from wall push ups, the knee push up can be the best step for beginners. Performing the exercise in a kneeling position will not build as much strength as a regular press up, but it can allow you to increase your confidence and refine your technique before tackling a more challenging exercise. To prepare for this exercise, get into a kneeling position with your hands placed on the floor directly beneath each shoulder. Your legs should be bent into a right angle, with your knees in line with your hips. Gradually move your knees further back until your body has formed a straight line from your shoulders to your knees. Use your abdominal muscles to hold the pose. Keep your spine straight and your head up as you lower your torso towards the floor. Your elbows need to stay in line with your body, until your chin is touching the ground. Slowly straighten out your arms until you have returned to your starting position. Repeat as many times as you can without fatiguing your muscles, or until you can perform three sets of twenty push ups. Once you have mastered the kneeling push up, you are ready to do a drop push up. You should start in the same position as a knee push up, but extend your legs until they are straight and your weight is resting on your toes. Lower yourself to the floor as you breathe in, then straighten your arms as you breathe out. It is essential that you hold your body in a straight line, and do not allow your spine to sag. As you get stronger and your technique starts to feel like second nature, you can increase the number of repetitions. With regular practice, you can work your way up to a hundred push ups within approximately three months. 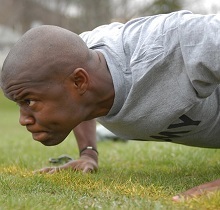 Push ups are a great exercise to include in your exercise routine, whether you are a novice or a pro. Start out with a simplified version of a push up in order to build strength and confidence, then work up to a more challenging workout. For some great examples of push up for beginners you can also check the video below… Take care! « SpecForce Abs Handbook Review – Is Todd’s System For You?